G'day! Welcome to my podcast - Aussie English from the sticks! I've been very encouraged by some of my listeners, who have sent messages asking when the next episode will arrive. Well here it is! This is episode four. As I mentioned in the introduction to this podcast, I will record something ocasionally when I find time. I'm a married man (sorry ladies) with four children. And that keeps me flat out. First off today I'm gonna give you a few words in Aussie English, then I'll give you all a bit of homework. Reckon you can handle that? OK, here we go. First off, listen to these words and see if you can notice something strange about Aussie English. Are you noticing something here? Something about words ending in the R sound? We're kinda lazy and leave it off. It's funny, cos when I was in Russia, one day I found my translators chatting together and laughing... they were mimmicking the way we say "SHOWER" and having a good old giggle about it. Our British friends have a similar issue, maybe not as strong. Now compare those words to how an American might say them. OK, that should prepare you for what you might hear if you are speaking to an Aussie. Especially if they say "G'day mate. That shower's blocked by a caterpillar, but I can't get hold of the plumber cos he's stuck on a roller coaster". Rightio, we come now to the part where I give you a homework assignment. Have you got a microphone? There's plenty of free audio recording programs at FileHippo.com - the one I use is Audacity. Now I want you to record your best effort at saying: "G'day mate, howzit goin?" Let me slow that down so you can copy me carefully. Email your mp3 file to auseng.podcast@gmail.com, and I'll pick a few of the best and put them in my next podcast. Well here I am at work, and you may be able to hear the noises of my work environment in the background. I thought I better finish off the recording so I can post the podcast. It's been a while, it seems it's very difficult to find time to sit down at the computer. So, I'm using my iPod to finish off this recording. Earlier I recorded some sounds of birds outside my house. I thought you might enjoy that as a little excursion. Enjoy this, and we'll see you in the next podcast. Cockatoos. Traffic. Magpies. That's a PeeWee. And crows. There's a crow. You can hear the magpies and the peewees. 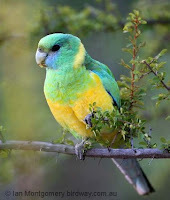 I can also hear a bullen bullen (note: commonly called Mallee Ringneck Parrot, see picture on the left). Well there goes a car, I'm sure you've got those. And sparrows. Sometimes we hear kookaburras. I'm holding baby Amalia right now. Rightio/Righto Okay; Sure; No problems! Awesome work Brett!, Aussie accent is the best, and it is rear to find specific podcasts on this... I hope you find more time to keep updating your posts. It's almost 1 year since I arrive in Australia. And now I'm in Tamworth, NSW. I love Australia and your podcast..!!! I want to learn more about Australia and English...!! So need your help through your super special awesome podcast!! I'll be looking forward to your next pod!!! Keep doing this great podcast. I'll be moving in July together with my wife to Australia as PRs. We're moving from Brazil so English is not our main language. And learning the Aussie accent is very challenging but we're working hard on it. Your podcast will be a great way to listen to it and actually I was searching for something like this for a while and yours is the first one I found. You did another wonderful job again. Brett, I copied your joke in episode 2 at my Toastmasters meeting. Bonza!